Thank you. We have recived your request and get back to you shortly. Hemkund is a Sanskrit name derived from Hem meaning snow and Kund denoting bowl. 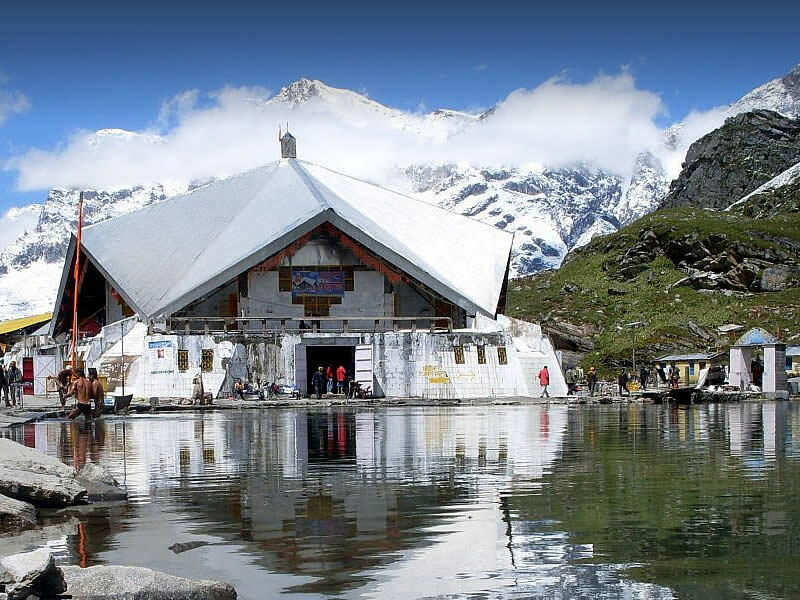 Gurudwara Sri Hemkund Sahib ji is not only a Sikh pilgrimage site, but also a holy place for the Hindus, known as Lakshman Lokpal, as it has a small Lakshman temple there. Located at an altitude of 4,632 metres (15,197 feet) in the Himalayas, it is surrounded by seven mountain peaks, each adorned by a Nishan Sahib on its cliff. This pilgrimage site in Chamoli district of Uttarakhand is devoted to the tenth Sikh Guru, Guru Gobind Singh and finds mention in Dasam Granth, a work dictated by Guruji himself. It is believed that the Sikh Guru had meditated in Hemkund in his previous birth, and this is also mentioned in Bachitra Naatak, an autobiographical account of Sikh Guru Gobind Singh. In addition, the Dasam Granth says God ordered Sikh Guru Gobind Singh to take birth while he was in deep meditation at the mount of Hemkund. The structure of the present gurudwara was built in the mid-1960s, when Indian army's Engineer-in-Chief, Major General Harkirat Singh visited the gurudwara. Major General Harkirat Singh selected Architect Siali to head the design and construction effort. After that, he made sure to visit Hemkund Sahib at least once a year, and also supervised the gurudwara's construction from time-to-time. The best time to visit Hemkund Sahib is May. In the month of July, there is heavy rainfall due to monsoons which increases the chances of landslides and route to Hemkund also remain in danger. When Sikh pilgrims arrive, they also dedicate themselves in repairing the damaged path over the winters leading to Hemkund. This according to them is Kar Seva or selfless service, a concept which forms an important tenet of the Sikh faith. 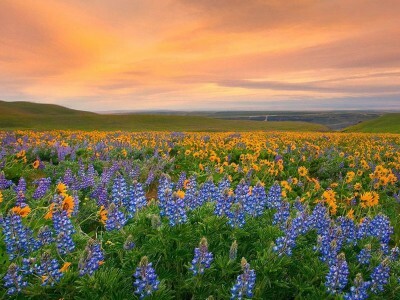 However, it's quite difficult to reach the site from October until April due to snow bound paths and glaciers. So, it's inaccessible from October. To reach Hemkund, you need to reach Haridwar, then via Rishikesh you can make 275 km journey to Govindghat. After that a 13 kilometres trek which is along a reasonably well maintained path will lead you to the village of Ghangaria (also called Govinddham). This path can be covered either by walk or by pony and a Gurudwara here gives shelter to pilgrims. In addition, there are a few hotels and a camp ground with tents and mattresses. 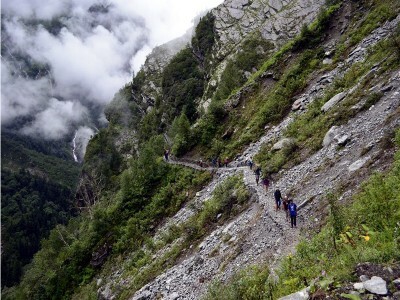 A 1,100-metre (3,600 ft) climb on a 6-kilometre (3.7 mi) of stone paved path leads to Hemkund. An important to note here is that you have to leave Hemkund Sahib by 2pm and make it back to Govindghat by nightfall, as overnight stay is not allowed at Hemkund. If you are coming from Delhi, then you can take the train to Haridwar and then travel by bus to Govindghat via Rishikesh. It is also possible to drive from Delhi to Govindghat, a distance of about 500 kilometres (310 mi) which takes around 18 hours to cover. Recently, an Indian airline company has started helicopter service between Govindghat and Ghangria. The flight takes about 5 minutes. The Gurudwara Sri Hemkund Sahib Management Trust, which is a seven member trust also established gurudwaras along the way, in Haridwar, Rishikesh, Srinagar, Joshimath, Govindghat and Ghangaria. Floods in Uttarakhand in the year 2013 destroyed many parts of Hemkund Sahib. Part of the gurdwara, at Govindghat collapsed, including the langar hall, which collapsed into the river, the parking lot was swept away, only bridge above the Alaknanda River was broken and the building next to it, and the entire footpath at 14,200ft, leading to Hemkund Sahib, from Govindghat was swept away.